This is the fourth in our series of messages on the Beatitudes. 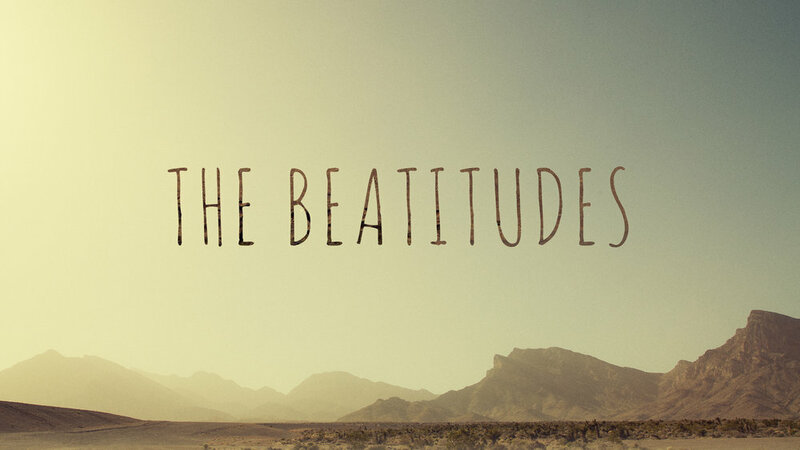 The Beatitudes are the opening statements of Jesus’ famous Sermon on the Mount. In His opening statements to this sermon, Jesus lists eight dispositions, attitudes, or temperaments of kingdom living. These dispositions of kingdom living are all said to be “blessed” which is the Greek word μακάριος, meaning “happy.” Jesus is telling the crowd that day, and of course you and me, that those who are a part of the kingdom and as they begin to see these dispositions develop in their lives . . . they are happy people and not just happy, but the source of their happiness is found in their relationship with God. It is divine joy, supreme bliss, transcendent happiness. So, these are eight dispositions, characteristics, or temperaments that depict a person who is a born-again believer, a kingdom citizen. We have looked at six of these dispositions of a kingdom citizen. This means that we are emptied of self and we are begging God to fill us. It is a removal of pride and seeing ourselves as destitute without Christ. In fact, this is the very disposition you had when you accepted Christ as your Savior; it is then that you realized there is nothing you can do to save yourself from sin without Jesus Christ. Then this disposition continues to grow in our lives . . . living daily in dependence on God, being poor in spirit and walking with Him will bring supreme joy and happiness. Meekness is not weakness, rather we found that meekness is having great power under control. Though we often think of anger as being an example of power out of control . . . and it can be, but having no anger is not meekness either. There is a balance of being angry over sin and over God’s holiness being assaulted, yet keeping it under control so that it doesn’t leave a wake of destruction in the lives of others. There is supreme bliss for the kingdom citizen when meekness is a developing disposition in their lives. Much like physical hunger and thirst, those who are saved should have spiritual hunger and thirst. For both our physical bodies and our spiritual lives, hunger and thirst are signs of health. Divine joy is available for the person who feeds on God’s Word and nourishes their spirit with the nutrients of God’s wisdom. We found that mercy is withholding the bad that someone deserves to get. Justice means they get what they deserve. But mercy withholds the bad a person deserves. I praise our God that I am a recipient of God’s mercy. If we got what we deserved under God hand, there would be no hope for any of us. We looked at a story Jesus told Peter about forgiveness and mercy in Matthew 18. We found that as recipients of the God’s mercy, we are to be merciful to others and withhold what other people deserve for the offenses they have committed against us. This Beatitude is talking about peace with God and peace in the midst of conflict. We found that peacemakers are ambassadors of God’s peace, a witness and testimony of what real peace looks like, a reconciler for peace with God, or you could say we are mediators of peace attempting to draw others to God’s peace. Yes, we should be peacemakers as much as possible in conflicts between people, but our focus is on peace with God. And the fact that we have peace in a world of turmoil, is a powerful testimony of God’s peace. I have so enjoyed this study, not because it is easy or non-confrontational to the way I live, but because it makes me realize so much more about the character of our loving God. Now we skipped the Beatitude in verse 8 last week and so I want to pick that up this morning. But before I do, I would like to read Matthew 5:3-16 again so we are reminded again of the big picture here. καθαρός meaning clean, pure; literally free from dirt. It is also used to indicate there is no mixture, something that is pure is a substance that is not adulterated or combined with another. It is pure. καθαρός is also used concerning moral and spiritual wrong doing. It is considered unclean when things of a immoral nature are involved (Friberg Analytical Greek Lexicon). The simplest way I know to describe καθαρός, at least in a general statement, is to be free from filth of any kind and not mixed with anything that contaminates. Okay, so what exactly are we talking about when it says this purity relates to a person’s heart? “The Pure in Heart!” The word “heart” is καρδία in the Greek. It is considered not just the seat of physical vitality, pumping blood throughout our bodies, but also as the innermost self, the source and seat of functions of soul and spirit in the emotional life, the volitional life, the rational life and viewed as the human dwelling place of heavenly beings and powers (Friberg Analytical Greek Lexicon). Pure in Heart is talking our being clean and free from filth in our innermost being spiritually speaking. Who we are on the inside, our motivations, desires, thoughts, and rationale. As a believer, a Kingdom citizen, we will find divine joy in purity in our innermost being, our spiritual life. Now this presents us with something that is not talked about a lot. There are two aspects of purity talked about in the Bible for our lives now. There is what we call Positional Purity and Practical Purity. I would like to spend some time one each one as I believe this is imperative to our understanding of “pure in heart.” When we refer to Positional purity we are talking about our standing before God. Practical purity is basically how purity is manifest in how we live our lives. Let’s begin with Positional Purity. Purity has a similar meaning as holiness, being sanctified, or set apart. In fact, the word sanctify is a term that is used often in Scripture with the idea of being set apart, made holy, or purified. With that in mind, now listen to how Ephesians 5 describes our position in Christ. 25 . . . Christ loved the church and gave himself up for her, 26 that he might sanctify her, having cleansed her by the washing of water with the word, 27 so that he might present the church to himself in splendor, without spot or wrinkle or any such thing, that she might be holy and without blemish. Here is a picture of Christ’s church, in other words, those who are believers, and he pictures them as washed and without spot or wrinkle, holy and without blemish. Now raise your hand if you feel that verse is describing you right now! Actually, I hope it is! You see, at the cross, Jesus Christ declared all who would believe in Him as pure, without spot or wrinkle. Listen to 1 Corinthians 6 as Paul describes a person who gets saved from a life of drunkenness, adultery, stealing, sexual immorality, and so on. These and other references in Scripture point to a definitive past action that sanctified us, or made us pure. Such “were” some of you. It always points to the work of Jesus on the cross of Calvary. If you have placed your faith in Jesus Christ as your Lord and Savior, you are clean, pure, free from filth in the sight of God. Jesus’ blood took care of that. We are redeemed, Hallelujah! Listen to a passage from 1 John as it further tells us that the blood of Jesus is the cleansing agent. Our standing before God is a position of purity. This is entirely a work of Jesus. You did nothing for it, you did not keep yourself free from filth, you did not remain pure even for a short time, this is all Christ’s work to bring us to a pure and righteous standing before God. It is an act of love, He did this for us though we are sinners! This is an act of mercy, He withheld what we deserved. This is an act of grace, giving us the position of righteousness through we did not deserve this gift. When God looks at believers around the world, all He sees is the righteousness of Christ. You and I are ascribed as holy and pure! I cannot imagine any saved person complaining about our standing before God. As I said last week, we certainly do not want to receive God’s justice. But all of this does present us with a problem, doesn’t it? We may have a position of purity before God because of what Christ did, but how does that play out in my life, in the way I live my life? Because, honestly, I know I don’t live a perfectly pure life. This brings us to our other aspect of purity. What do we do about this? If we are pure and righteous from God’s perspective, though I sin, Christ’s blood covers it, do I really need to worry about sin in my life? If I am pure from God’s perspective, that’s all that matters, right? I shouldn’t have to worry about trying live a pure life, right . . . Wrong! If you read the entire Psalm, you will find that David came to God, broken, desiring cleansing, and a restoration of his joy. Think about this for a minute. This was a man of whom it was said that he was “a man after God’s own heart.” Yet David did something terrible. He committed adultery with Bathsheba and had her husband murdered. But when he was confronted with his sin, David turned and sought cleansing. In other words, David recognized that his relationship with God did not match with how he was living his life and there is a huge problem with that. He may stand as righteous in his faith, but he was living in the filth of the world. His heart was not pure. Now we are not just talking about a person who cannot make up his mind, or an evil person, but a Christian . . . a Christian who has a heart for something more than just God. Like a man who has desire for both his wife and another woman, or a person who has a desire to be rich and a desire to never have to work. Here we are talking about a person who has a heart for the things of the world but desires to have a relationship with God. But we are told that this kind of person must purify their hearts. Why? Because a person who has a pure heart desires only one thing. The motivations for everything they do, everything they say, and all that they think is driven by one thing – their relationship with God. Remember the definition of καθαρός? Free from filth, not mixed or combined with things that contaminate. Purity of heart is a single, clean, pure, unadulterated, motivation, or focus of our innermost being. Has God an impossible ideal before us? It almost sounds like He has set us up to fail, hasn’t He? Listen, purity of heart comes down to what motivates you to do the things you do. How you process your thoughts about something. How your desires and rationale align with God’s will for you. Purity of heart does not mean you are sinless perfection, but a person who has a pure heart is certainly broken when sin does happen. There is an inner repulsion to sin because sin is in opposition to God. There is a pursuit of holiness and an active dedication to God and His Word. Purity of heart means you put one thing above everything else in your life, your love and relationship with the Lord. Why does this bring us supreme joy and bliss, μακάριος? What does that mean? For they shall see God! Is this just referring to some future time when we will see Him in Heaven? I do not believe that is what Jesus is telling us. As we begin to pursue the Lord, learn of Him, desire to be like Him, we begin to see God, being put on display in our lives. Why, because we are becoming a new creation as His characteristics become a part of who we are. 3 Who shall ascend the hill of the LORD? And who shall stand in his holy place? 4 He who has clean hands and a pure heart . . . Purity of heart in the practical sense is not about sinless perfection, but about how we process the things we do in life. Pure motivations, pure desires, pure thoughts, pure rationale, . . . pure heart. I guarantee that if we have a pure heart, we will sin less and be broken over sin always. When that happens, God is more evident in our lives because we are beginning to see God more clearly from how we know Him. We see God with our spiritual eyes. We do that by cultivating our fellowship and personal communion with Him. Though we stand before God in a position of purity because of the blood of Jesus Christ, we should be cultivating purity of heart practically in our lives through meditating on His Word and having personal times of prayer in fellowship with God. As we do, we will see God and things will change in how we live our lives. Pure in Heart is not so much about sinless perfection in life as it is about the desires of the heart, the motivations of the soul, the thoughts of the mind, and the rationale of the will. Purity of Heart is when these begin to align with the character of God. True joy and happiness is found in the pure in heart for they see God.